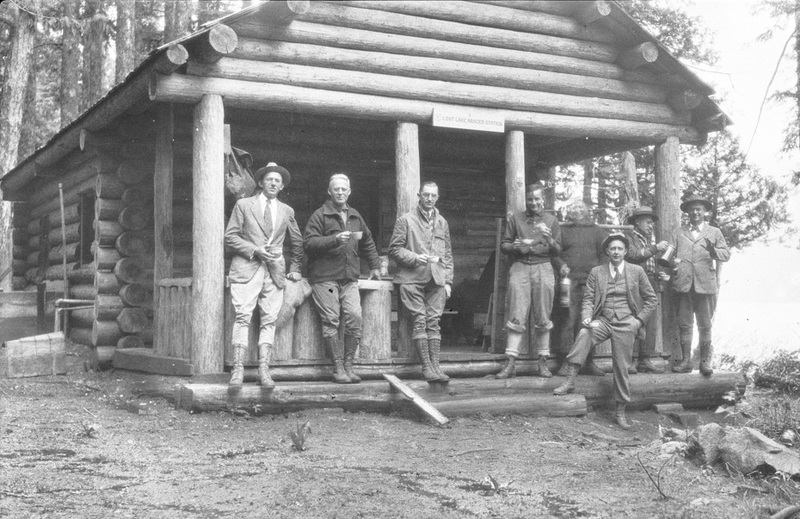 That's Alva Day and friends at the Lost Lake Ranger Station, June 1933. Is this building still around? The man third from the left is Percy Bucklin. I haven't jaunted around the lake for such a long time I am not sure that this building is still there. I remember it as a teenager and that it was down at the far end of the lake. Happy Thanksgiving to all my "history" pals. Looks like the cabin had running water. You would think after this many photos I would immediately recognize Alva Day. Is he the one pouring coffee? I guess I should have looked more closely. I thought the man with one foot on the ground was Day because he dresses the same, but I guess Alva Day was behind the camera. There will be a small Thanksgiving treat at HHR tomorrow morning when you pop your turkeys in the oven. Am fascinated that some are wearing a jacket and tie! Morning coffee with toast perhaps ... ? .... by chance can anyone make out the label on the can in hand on the far left ... ? I looked at the hi-res scan. Unfortunately the exposure was poor so the negative is very grainy. The can held by the man on left has an oval image with a hyphenated name above it. I'm going to say "Hills-Dale" but that's really just a guess. He's also sitting on a burlap sack with unreadable words on it. The object held by the man to the right of the door opening looks more like a burrito than a piece of toast. Thanks Arthur .... perhaps then Hills Bros coffee and flat bread. Beautiful construction on those FS buildings, true craftmanship. This appears, I believe, to be a station that was close to where the old road dropped down to the lake. The building at the "far end" of the lake was a hiker's/camper's shelter that was built by the CCC during the depression. The original ranger station was on the far side from the road and was within the Bull run Reserve . It burned down many, many years ago. I remember the sleepers still in the ground that outlined the original. It was a double building with a breezeway porch between. It was not far from the much later cabin that Grover Carter built on private property that existed up there at the time.